Way back in 2009, Universal Pictures announced plans to bring Battlestar Galactica back to the big screen, following the success of Ronald D. Moore's hit Syfy series which ended its run that year. Over the years, Bryan Singer was attached to direct at one point, although be parted ways with the project in 2014. Today we have word from The Hollywood Reporter that the studio is taking another crack at the big-screen project, with producers Michael De Luca, Scott Stuber and Dylan Clark boarding the project. We last reported on the Battlestar Galactica movie back in 2014, when Transcendence writer Jack Paglen was brought on to work on the script. Back in 2011, John Orloff (Anonymous) signed on to write the script, which was said, at the time, to be based on the original 1978 Battlestar Galactica TV series, and not the 2003 Battlestar Galactica remake series. The project doesn't currently have any writers attached, and no director has signed on yet either. 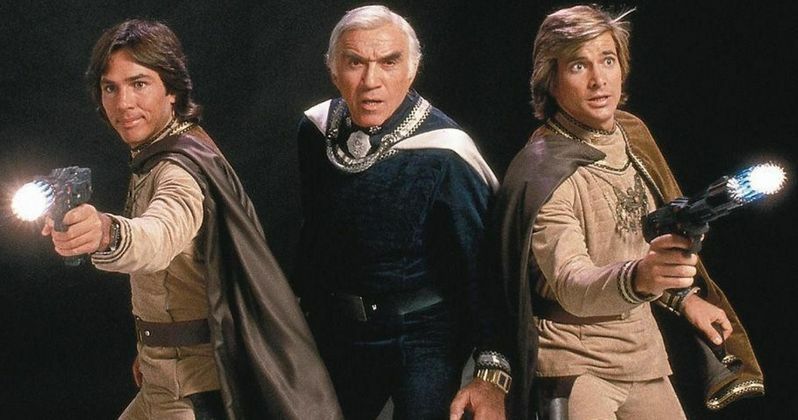 The 1978 version of Battlestar Galactica ran for just one season, starring Richard Hatch, Dirk Benedict and Lorne Greene, centering on humans from the Twelve Colonies engaged in a war with the Cylon robots. The 2003 series starred Edward James Olmos, Mary McDonnell, Tricia Helfer and Katee Sackhoff, and ran for four seasons on the Syfy Channel. The remake also spawned the prequel series Caprica and the web series Battlestar Galactica: Blood and Chrome. Universal is reportedly trying to turn this Battlestar Galactica movie into a "massive event franchise," although no story details were given for the sci-fi project. It isn't known if the original series creator, Glen A. Larson, or the TV remake creator Ronald D. Moore will be involved in any way, shape or form. One thing that is certain, though, is that all of the new producers have long-standing relationships with Universal. Michael De Luca was one of the producers on the studio's blockbuster Fifty Shades of Grey, which made over $550 million worldwide last year. He also produced Universal's Dracula Untold in 2014. Scott Stuber and Dylan Clark's Bluegrass Films produced Ted 2 for Universal. They are also prepping the Boston Marathon bombing movie Patriots' Day with Mark Wahlberg. What do you think about Battlestar Galactica coming back to the big screen?